Home / Rides & Events / Other Motorcycle Stories / Spring is Coming! It’s official. I’m all revved up for spring. May as well shout it, this is it folks: SPRING IS COMING. We’re covered in snow and I don’t care. Spring is coming. Sure late January may feel like the dead of winter, but I’ve had feelings for every woman who I’ve ever neglected and every woman who’s ever left me, so what’s a feeling anyway? The facts are as clear as freshly polished chrome on a hot summer day and here they are: yesterday I left work at the end of the day and the parking, though covered in packed down snow, was sunny. I was no longer leaving work to enter a world of darkness. The first sign of spring came on the weekend. I began looking at some classic motorcycles for sale, the cheaper the better, as museum pieces for my home. I didn’t read the sign. I hadn’t seen the light. Yesterday after work… I saw it. Cl-, Cli-Cli-Cli-Cli-Cli-, Click, BRAP! Brap brap brap brap. My little heart fired up. A throttle twist of the throttle to open up the fuel lines. Hold it open longer. Is this real? Is spring coming. I stayed up well past 2:00 AM, surfing the internet for the accessories I wanted for my motorcycle this spring, finding the best prices, reading reviews, deciding on what it was that I… just. had. to. have. It wasn’t about a museum piece that I could admire from IN the house anymore. It was about all of the things I would do OUT of the house. It was about life, love, the road, v-twins and long legs, high heels on foot pegs inch above hot exhaust pipes playing all of the right sounds. My heart was firing on all cylinders now. A smooth and steady idle. 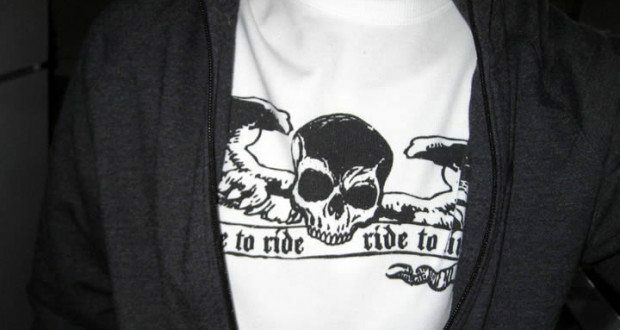 Today I put on my “Live to Ride – Ride to Live” t-shirt. It’s a little lame. It even has skulls on it, just like the YouMotorcycle logo, to make it even more cliché. When I first started riding I wore it all of the time. That was about 7 years ago. I don’t wear it much anymore. There was a time when I wore it on all of my long rides. No one is going to see it. It’s on under a nicer shirt. My coworkers won’t know I’m wearing it, and I don’t much care for the impression my riding makes on them anyway. There was something about putting that shirt back on this morning that just felt so right… even if it was only for a short scooter ride to a snow filled work parking lot. Spring is coming folks. Get excited! 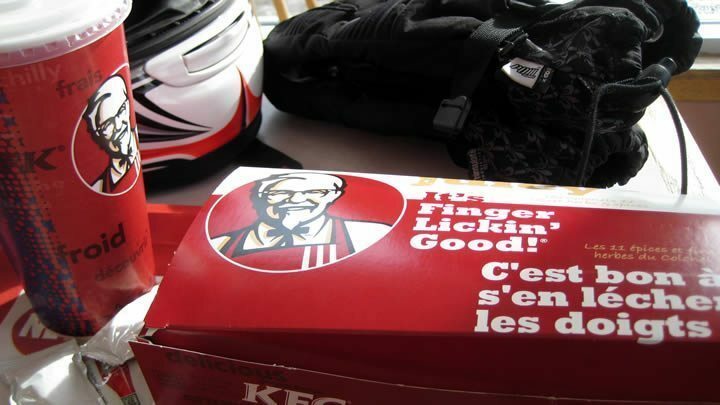 Winter riding… FINGER LICKIN’ GOOD! I think Spring, Summer, (hell, I’d settle for Autumn) can’t get here soon enough!! And while we’re on the subject, let’s not hear any more nonsense about “global warming”. Just where’s that happening, anyway? I guess wherever it is, all the bikers THERE are happy as hell. I’m certainly not. How about giving us 10 deg. C? I could live with that. Not askin for much, here. Ten degrees is like a cold June morning. I’ll TAKE it! No problem putting on a sweater or two underneath the leather. We’re not gonna do anything crazy out there for our first couple of rides anyway, right? 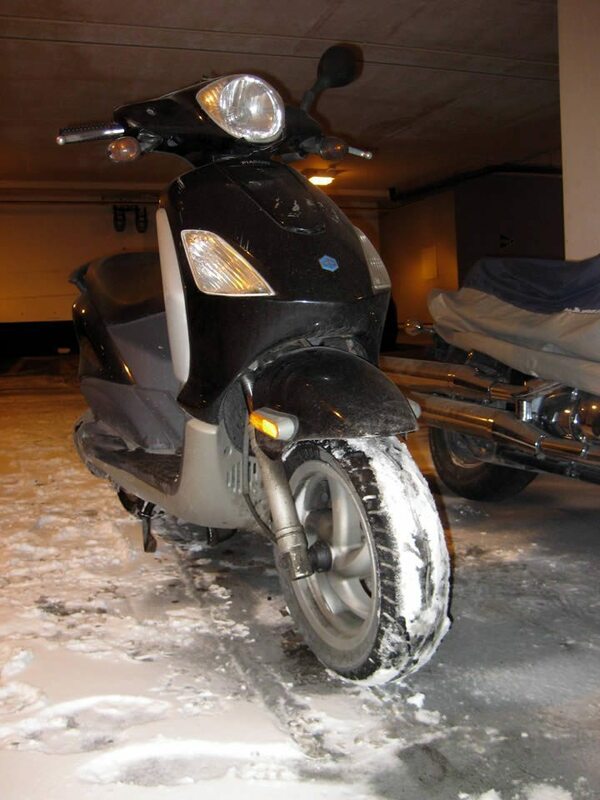 Tire’s are cold…pavement’s cold. Muscle memory needs a little refresher. Nobody wants to lay it over in those conditions anyway, so, who cares if your ‘look and feel’ is a little more Michelin Tire Man than Valentino Rossi. Dangling your leg in the corners is so last Tuesday anyway! May as well have your long-johns on. 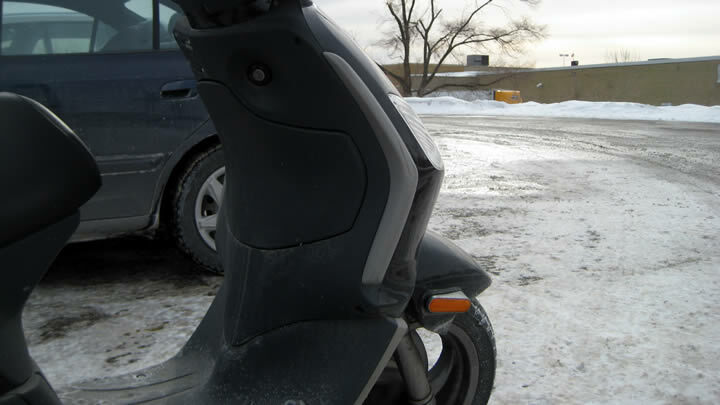 Just give us one measly week (so everybody can pick the day that works for them) of10+ degree weather…so we know that motorcycling as we know it….hasn’t come to an end…with no official announcement! Not to be a stickler for details, but… I think global warming was causing massive rains in polynesia which was detouring the wind current northward which meant that colder air was coming down upon us. Go to typhoon countries and countries caught in draught and ask where global warming is happening. Scary stuff happening out there! I hate to be a realist, but it hasn’t even been Winter for a full month yet. We’re still 2.5 months away from Spring (March 21st). Unless you live in Southern California, Southern Nevada, Arizona, or Florida, you’re screwed. And here in Oregon where it rains most of the freakin’ time, we’re screwed until July. Hopefully I can get the heck out of here before then (and I’m not coming back). Thats one way of looking at it. Another way is to think, hey, we’re past winter solstice, the days are already getting shorter!